Wind Cave National Park, established in 1903, was the first national park to protect a cave. It is the eighth national park overall and was established to protect the boxwork formation and American Indian spiritual site. While there are many caves in the national parks system, only three official national parks have a cave as its main attraction. Each of the three caves has its claim to fame. Mammoth Cave is the largest, Carlsbad Caverns is the prettiest, but Wind Cave is the first. 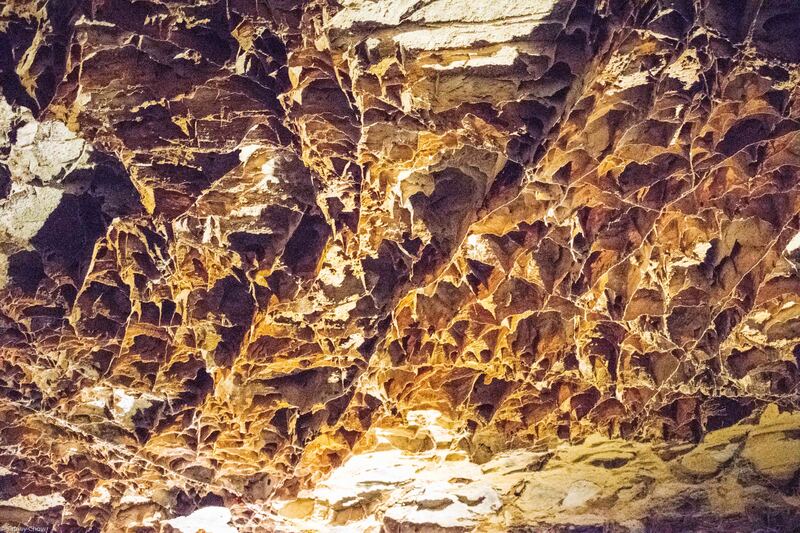 Over 90% of the world’s boxwork formation is in Wind Cave. 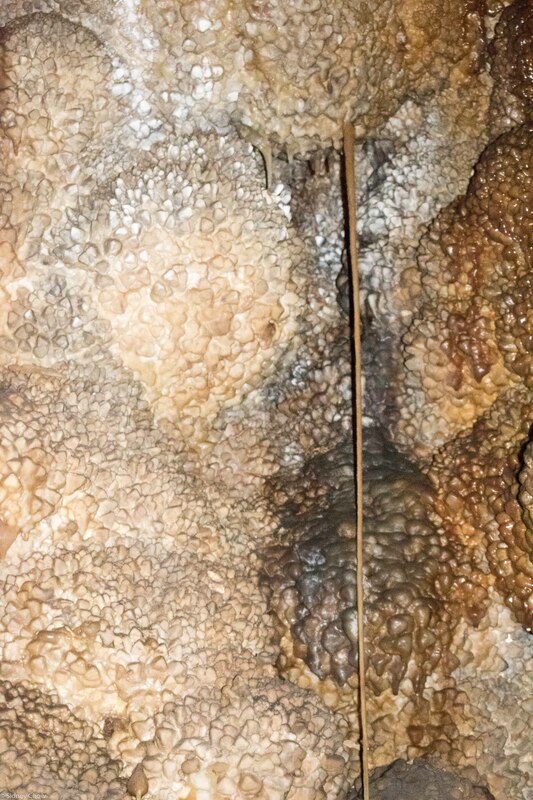 While the boxwork formation is interesting, it is not as stunning as some of the other caves. The day was cloudy, dreary and misty, just perfect for some indoor activity like the natural entrance cave tour with Ranger Nate. The “wind” in the Wind Cave came from wind that blew in or out at the natural opening, depending on outside atmosphere pressure. To preserve the natural pressure differential, we first went into an air chamber before we could enter the cave. I felt like we were going into space! Ranger Nate told us about the history and the geology that formed the various formations in the cave, especially the boxwork, named because it looked like post office boxes, but it looked more like honeycomb to me. The steps were sturdy and well made, with solid handrails for a sense of safety. The 75 minute tour reached 275 feet underground, about the mid-level of the explored cave. During every cave tour, the ranger did the requisite total darkness show, when all lights were turned off and you can’t see anything but pitch black. Each time, I thought of the risk the cave explorers took of losing their light source, especially in the early days, while deep in the cave. The first explorers didn’t have flash lights! How did they light a lantern when it was pitch black? Regardless of the cave we were at, someone’s phone glowed during the darkness show, even after the ranger told everyone to turn their phone off! Some people just don’t know how to follow directions. Wind Cave, by itself, was interesting but not enough to be a national park. There were interesting hiking trails above ground, but not spectacular. We hiked the Wind Cave Canyon trail that was a flat walk through grasslands after an initial descent. The trail ended at a fence that separated Wind Cave National Park from Custer State Park, what a let down. Normally, the end of a trail had interesting views, not this one. However, the Black Hills area, which Wind Cave is part of, offered so much more. 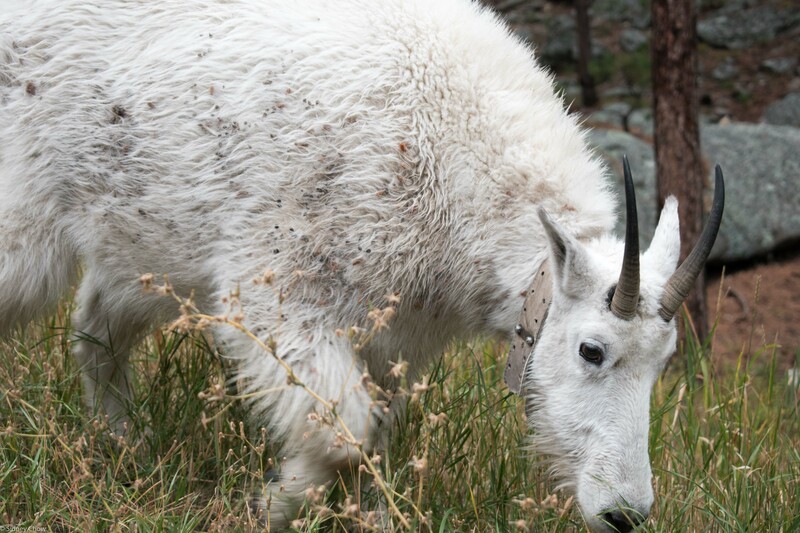 Custer State Park next door has abundant wildlife with its famed Wildlife Loop Road. Mount Rushmore is a national monument that is an American icon. Devils Tower, also a national monument, is unique and strange. 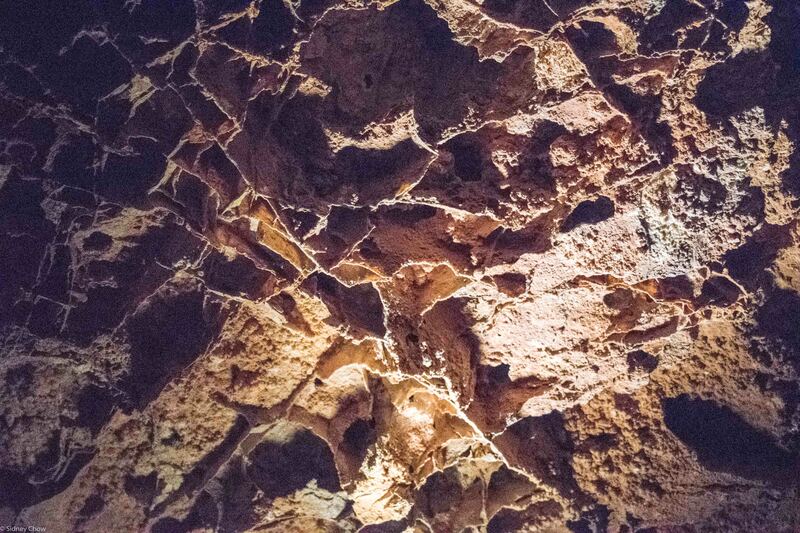 Jewel Cave national monument is even more interesting than Wind Cave. People speculated if the two caves connects. There are numerous scenic drives and places of interest in the area, with many quaint, historical towns that have a western motif. Why not combine all of this into one large national park and manage it as one? The answer, as always, is complicated. The reasons are historical and land use. National parks have stricter use restrictions, which many locals do not want to apply to non-national park areas. Historically speaking, the governor of South Dakota, Peter Norbeck championed the cause of Custer State Park and established it in 1919, when the national park service concentrated on the cave part of the national park. Wind Cave by itself had 617,377 visitors in 2016. The combined visitor count for Wind Cave, Jewel Cave (137K), Devils Tower (496K), Mount Rushmore (2.4 million), and Custer State Park (1.9 million), would probably be more than 3 million. (You can’t just add up the numbers because like us, many visited multiple sites on a single trip.) That would make a “Black Hills National Park” one of the top 10 most visited national parks. Some say we shouldn’t combine national monuments with national parks, or we can’t have towns in the middle of national parks, or we can’t combine national and state parks. Each situation already has a precedence. For example, Cuyahoga Valley National Park has towns in and around park lands, as does Redwood National and State Parks. As the name implies, Redwood figured out how to combine the administration of national and state parks. It is possible but is there the will? Custer State Park is well known for wildlife, and we were thrilled the park lived up to this reputation. 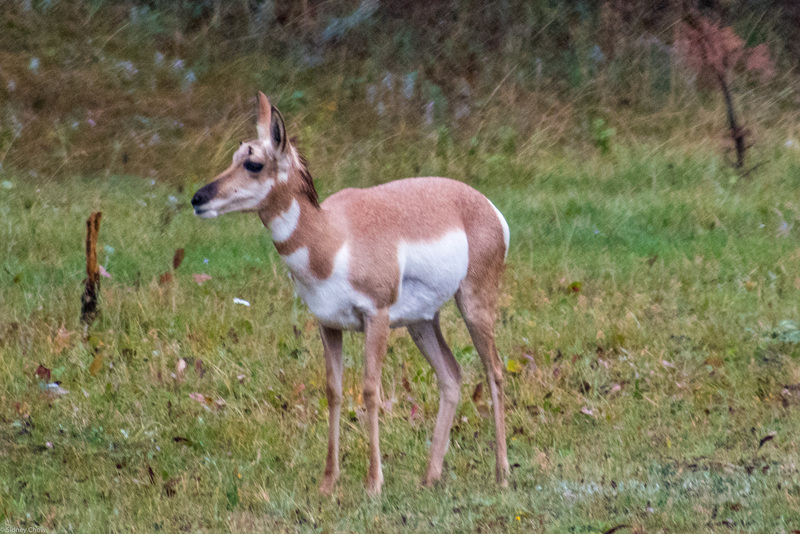 Along the Wildlife Loop Road, on a grey misty late afternoon, we saw lots of wildlife. Bison, the largest land animal in the US that is six feet tall at the shoulder, were everywhere, including two that trotted across the parking area of an overlook and a herd of several dozen that grazed in the grassland. Donkeys staked out strategic places on the road and begged for food from passing cars. Pronghorns looked up curiously at us in between bites of grass. A goat with a tracking collar grazed a few feet from the side of the road and looked up occasionally to make sure we were not going to run him over. 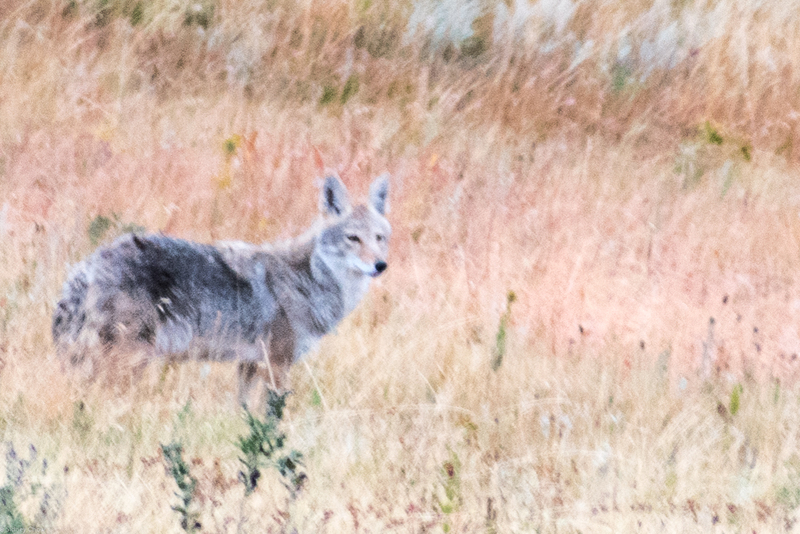 A Coyote tried to blend into the tall grass but we spotted him as he trotted off looking for prey. We saw too many deer on the side of the road to count, as I worried about them jumping in front of the car. Wild turkeys were plentiful as I thought about snatching one for Thanksgiving. 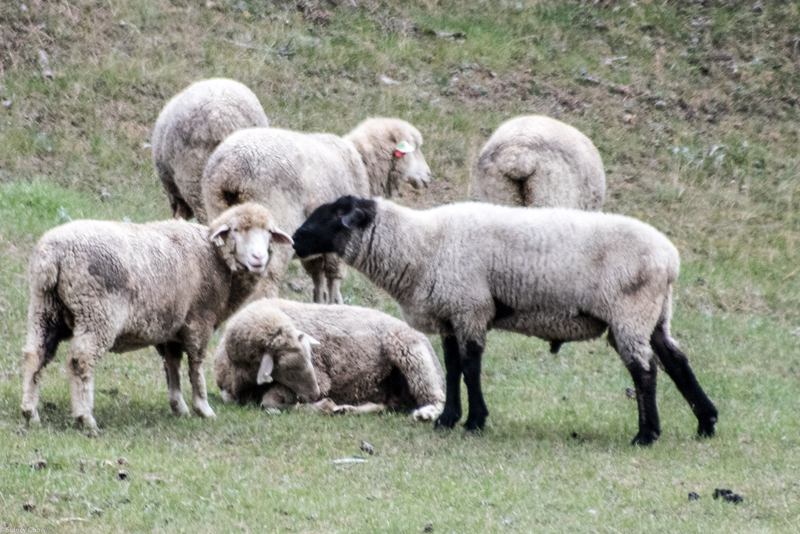 Sheep grazed in grass near the road. The variety of wildlife was stunning and we didn’t even count the birds! 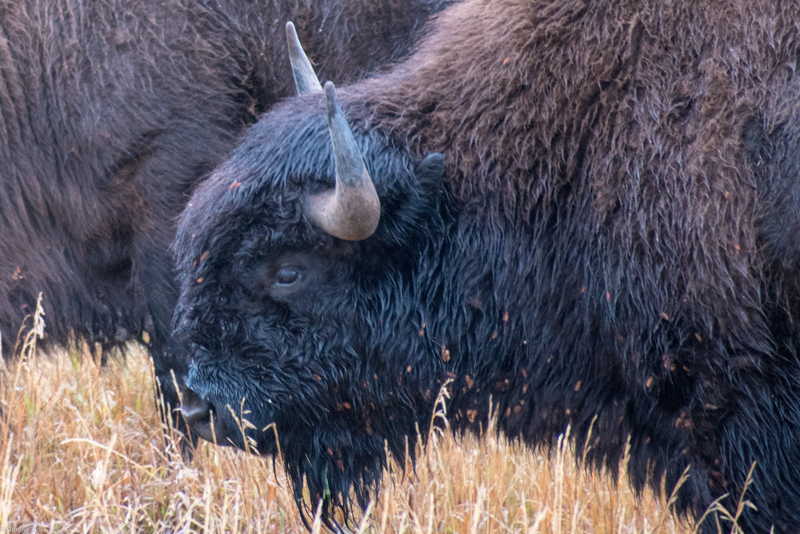 There is an annual bison roundup at Custer State Park where some 20,000 people watch the cowboys and cowgirls round up thousands of bison as they enter the corral in a thundering stamped. We missed it by a day due to our travel plans but it must be a sight to see! 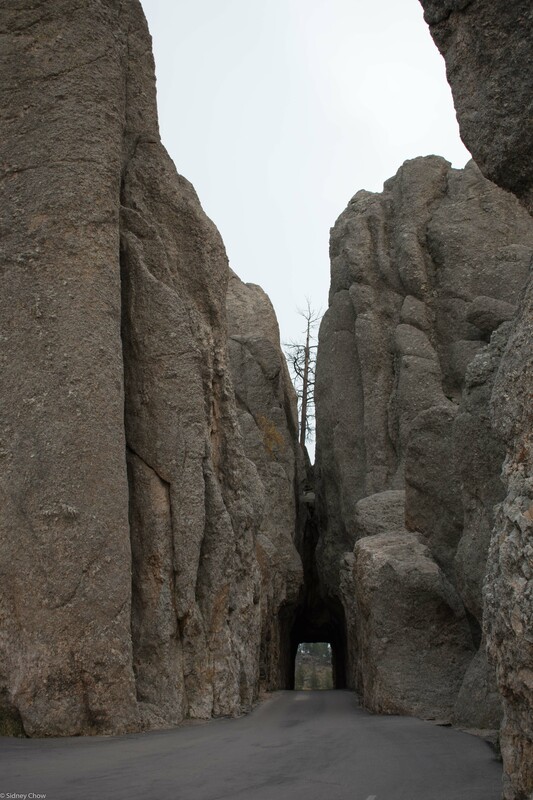 Needles Highway in Custer State Park was by far the most scenic road in the Black Hills. The road threaded through tall rock formations that spire up and looked like needles. With each hairpin turn, we saw a new perspective of the formations. The highlight was a single lane tunnel that threaded between two large spires, a really pretty sight. Iron Mountain Road was also an excellent scenic drive through hairpin turns and short tunnels, some tunnels framed the distant Mount Rushmore! 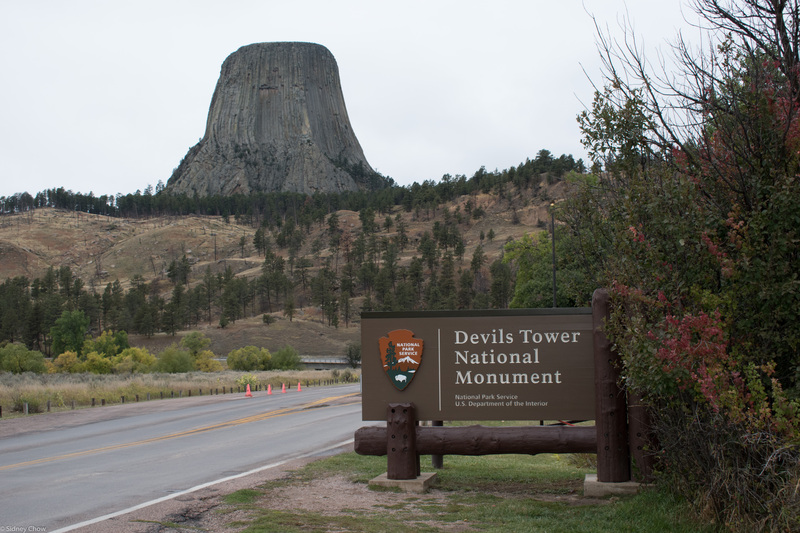 As we drove toward Devils Tower, it came into view and was instantly recognizable. Nothing was subtle about it. It looked like someone put a large can of soup on the very flat prairie. The area around it was flat and all of the sudden, this fluted cylinder that seemed out of place appeared. This was a great setting for the 1970s sci-fi movie that gave this national monument notoriety. Unless you are a rock climber, there wasn’t much to do there except to gawk at it. We circled it on a nice, short trail that had distinctly different vegetation on the north side compared to the south side. There was a rock climber about 1/3 of the way up who didn’t really move during the two hours we were there. I wondered if he was resting or stuck. Like Wind Cave, Jewel Cave was also only accessible with a tour. An elevator took us down and back up, but there were 723 steps, up and down, during the 90 minute scenic tour. This park had more interesting and prettier formations than Wind Cave, a historic CCC (Civilian Conservation Core) cabin, and a beautiful trail that connected the main cave with the CCC cabin. From a pure cave perspective, this is the better cave to visit, but for us on the quest to see all of the official national parks, Wind Cave was a must. One especially interesting formation at Jewel Cave was the “soda straw”, which was hard to appreciate in photos, but very interesting. Just think about how this was created over thousands of years of precise, slow drip, and how fragile it is. 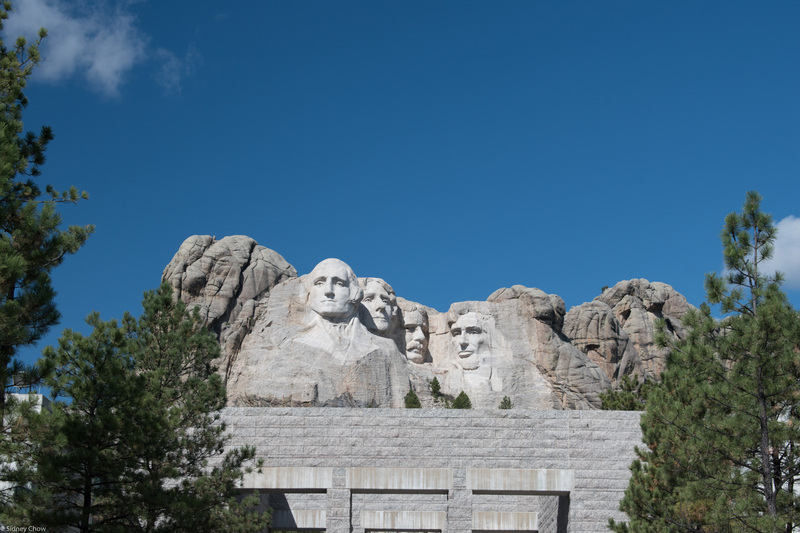 Mount Rushmore, an American icon that is instantly recognizable by most Americans, receives nearly 2.5 million visitors a year. This national monument is well done, with an excellent museum on the history of Washington, Jefferson, Lincoln, and T. Roosevelt, as well as how the monument came about. The methods used to carve the life-like faces of the great presidents was fascinating. Our view of Mount Rushmore on the first try. What are those people looking at? We went back three days later and had a much better view. I was very happy we could make a second visit but felt bad for all those in a tour group that had to follow a schedule and missed the view. 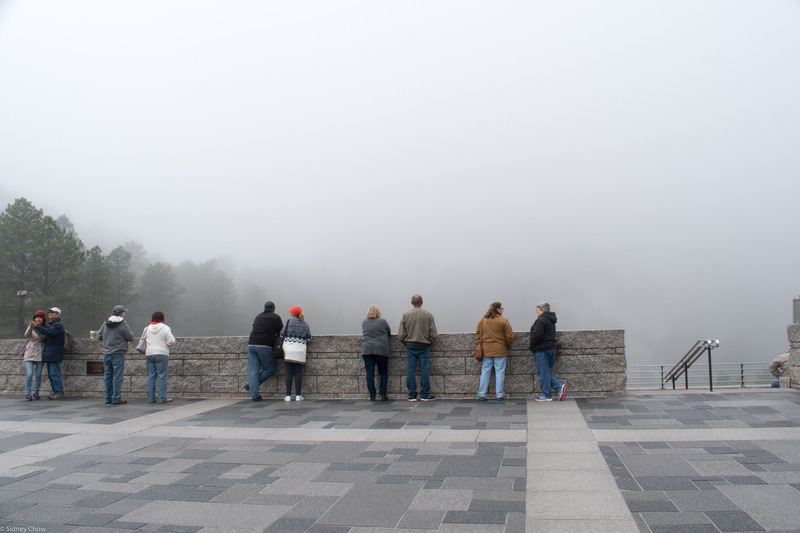 The ranger told us it was fogged in for the full day before our first visit and the morning of our first visit. We spent a couple of hours on that first day to tour the museum and hiked the President’s Loop trail hoping for the fog to lift. It did, a little, but not enough for a clear view. View of Mount Rushmore on our second attempt. The sculptures were not huge, only about 65 feet tall, but the faces expressed great emotion, especially the eyes. The walking loop around the sculpture had a few hills but it was relatively short and gave us many vantage points of the sculpture. Mount Rushmore is one of those famous landmarks, like the Statue of Liberty, that is part of American history and is a must on any bucket list. 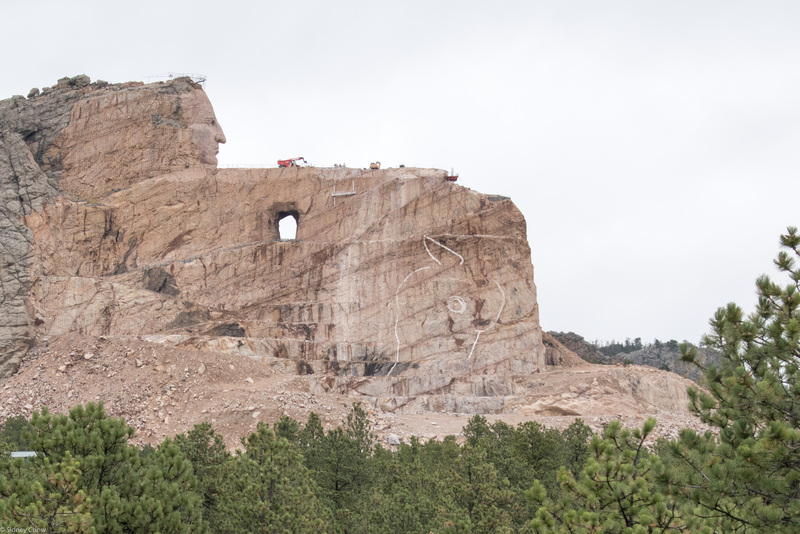 The Crazy Horse monument nearby is, and will be for many years, under construction. It is huge compared to Mount Rushmore and as of 2017, only the face was done. There is an excellent Indian museum with lots of interesting crafts, history, and a buffalo exhibit. When it’s done, it will be the largest mountain sculpture in the world but progress is slow due to funding. It’s ironic the general Crazy Horse defeated, General Custer, has a town named after him, right next to the Crazy Horse monument. Explore the seemingly trivial, and you many find great treasures, just like the early explorers investigated wind coming out of a hole in the rock found a beautiful cave. Wind Cave National Park by itself is interesting, but not remarkable, unlike most other national parks. However, the surrounding Black Hills area, combined with Wind Cave, makes this an excellent destination for sight seeing, camping, wildlife viewing, and water sports at the numerous lakes. There are many other minor attractions such as the historical steam engine railroad and a zoo for the family. Towns with the wild west motif, like Deadwood and Keystone, can entertain people of all ages. 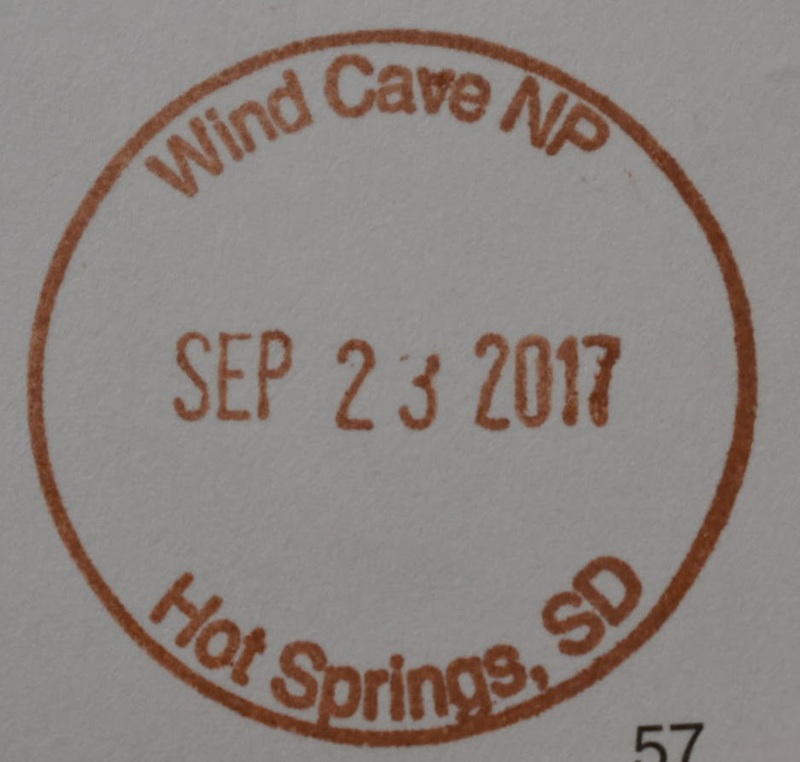 Have you visited Wind Cave National Park? Leave a comment below on your experience. Click on the Follow link and get an email when new postings are available. I will not share your email so no worries. One day is more than enough for just Wind Cave. Get to the visitor center early and buy tickets for the tour of your choice, most likely the Natural Entrance tour. After the tour, hike a trail of your choice and ability. Get to the caves early to ensure short wait and availability of tour tickets. Most tours are on the first come, first serve basis for the day of the tour. Quaint towns such as Deadwood, Custer, and Keystone are interesting places to have lunch, dinner or just linger to enjoy. Plenty of services are available near the attractions. Take the Wildlife Loop Road at dusk or dawn, when you will see the most wildlife. The new Custer State Park visitor center is excellent and worth the visit. Interesting dishes to have: Indian Taco, Buffalo burger or pot pie, and a pie at The Purple Pie Place in the town of Custer. I am glad you mentioned Custer State Park. The level of quality of this state park exceeds most National Parks imho. Did you see Sylvan Lake in CSP? Breathtaking rock formations around the lake and really fun hikes. Wind Cave is a bit of a local joke, and on top of that South Dakotans are very anti federal government so it doesn’t get much local love. Did you happen to drive through Spearfish Canyon? It is a very beautiful drive and led Frank Lloyd Wright to say “But how is it that I’ve heard so little of this miracle and we, toward the Atlantic, have heard so much of the Grand Canyon when this is even more miraculous.” To me this is way over the top, but it is an amazing little Canyon. There are some really cool off the beaten path things in the hills as well. Hippie Hole is a freaking awesome place to swim and dive. Google some videos if you get a chance. As you can probably tell from my “ratings” section, I’m not that impressed with Wind Cave, by itself. The whole Black Hills region, however, is fantastic. CSP is very nice and we missed the annual bison roundup by a day. Spearfish Canyon was awesome. We did the hike around Sylvan lake and yes, the interesting and strange rock formations. The lake itself is beautiful. The needles highway was also excellent. I will check out Hippie Hole. The name, by itself, is already interesting. Oh, that view of the Devil’s Tower automatically jotted my memories of those 5 tones from C.E.O.T.K. Kind of eerie how iconic that movie made this tower out to be. I too would have gawked at it for a few minutes and moved on if it had not been for it. And Mt. Rushmore, it must be a place that you had to be there to revel in all it majestic presence. After reading this, I can’t get that 5 tone sound out of my mind! As to Rushmore, it’s smaller than I imagined but the sculpture is more lifelike and “emotional” than I thought.